After Saturday’s medal disappointment and Sunday’s rain, it’s good to know that every cloud has a Silver lining! Not only did Lizzie Armitstead bring home Britain’s first medal in the Olympic Cycling but The Exchange Shopping Centre’s Street Party to celebrate the big Race Weekend raised hundreds of pounds for the Royal Hospital for Neuro-disability. 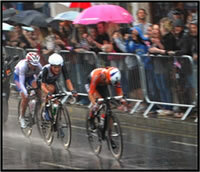 The atmosphere was electric as the world’s top cyclists went through Putney a total of four times over the weekend. 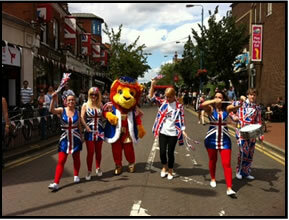 In between, there was fun for all with music, fashion shows and entertainment to amuse the crowds. Radio Jackie contributed to the festival ambience with daily competitions. There were also plenty of activities for younger ones including an Eddie Catz bouncy castle, giant chess and a magician. Trend loving race-goers took fashion inspiration from a Best of British Fashion Show inside The Exchange with Autumn Collection previews from the likes of Fat Face, Gap and Gap Kids, Huttons, Monsoon, Accessorize, Next, Office and Phase Eight. A really popular activity inside the Walkers Place Marquee was the Wattbike created with British Cycling to provide an affordable indoor bike for training and testing and supplied for the event by the Token Yard Club. A new Mark Cavendish wasn’t discovered but everyone had great fun measuring their power output and heart rate as well as improving their pedalling technique. The Union Jack Flash Mob with London Lion kept everyone entertained despite the adverse weather and Waitrose very generously handed out free treats including strawberries and cream. The Lacy Road 2012 Street Party was generously sponsored by The Exchange Shopping Centre, Workman LLP, Savills and Allan Fuller Estate Agents. Other sponsors include Waitrose, Gidden Place, The Flowersmith, Photo-Me, Eddie Catz and Token Yard Club.